(Open Box) HOOVER� SHOULDER VAC PRO COMMERCIAL BACKPACK VACUUM CLEANER WITH 48-INCH SJT CORD, 8.5 AMPS, 9.2 LBS. (Open Box) HOOVER� SHOULDER VAC PRO COMMERCIAL BACKPACK VACUUM CLEANER WITH 48-INCH SJT CORD, 8.5 AMPS, 9.2 LBS. 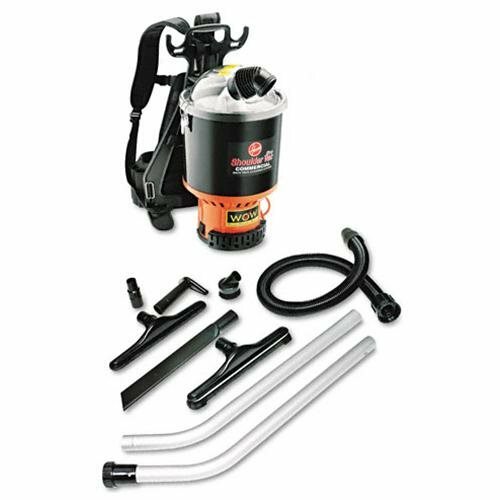 8.5 Amp motor, Quiet 66 dBa, 1 - 1/2" positive locking hose and attachments, chiropractor designed, ergonomic harness includes sternum clip to secure shoulder straps, clear dome lid for instant dirt inspection, shake-out cloth liner, Hypercone� HEPA cartridge filter, 48' 3 wire quick disconnect SJT cord, 9.2 lbs, 2 year commercial warranty. 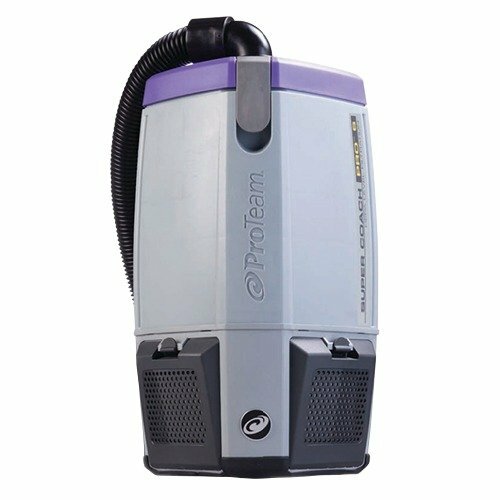 BP-1400 Backpack Vacuum Cleaner Cleaning has never been so easy. 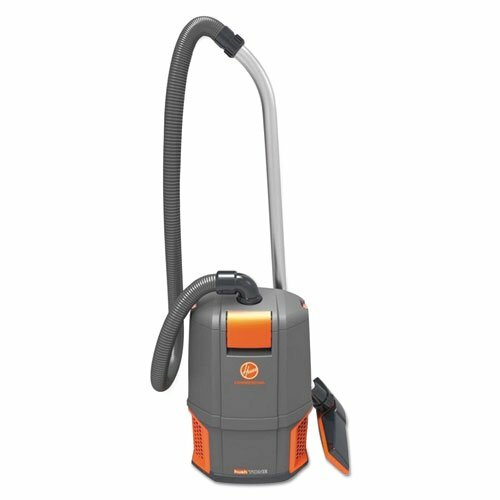 This commercial grade vacuum from Koblenz has a powerful 1400 Watt/11.5 amp motor but is lightweight weighing in at only 11 lbs. It features a 4-stage HEPA filtration system low-noise operation (only 71dB) and maximum operator comfort. 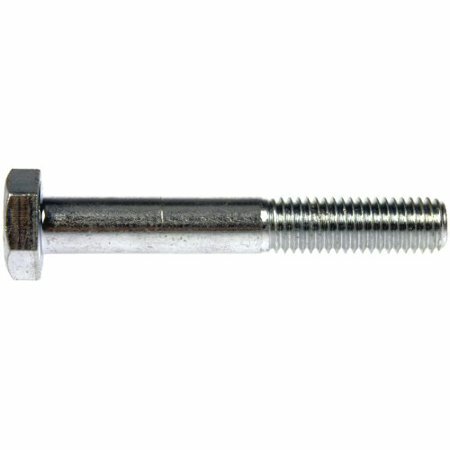 It has a 50' pigtailed line cord which allows for cleaning largr areas and saving time. It is ergonomically designed with padded shoulder straps. 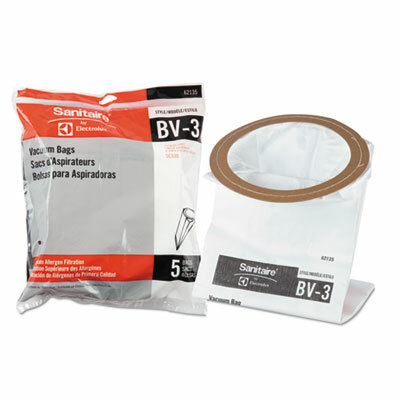 Comes with disposable filter bag and complete set of tools: 5' stretch hose 2-pc. wand carpet tool 14" bristle floor tool crevice dusting and upholstery tools. This professional backpack vac offers versatility durability and great performance. This item cannot be shipped to APO/FPO addresses. Please accept our apologies. Don't be intimidated by big messes and nasty spills. This backpack vacuum cleaner is capable of handling even the nastiest spills�and can do so at the 69 dB rating for whisper-quiet operation. 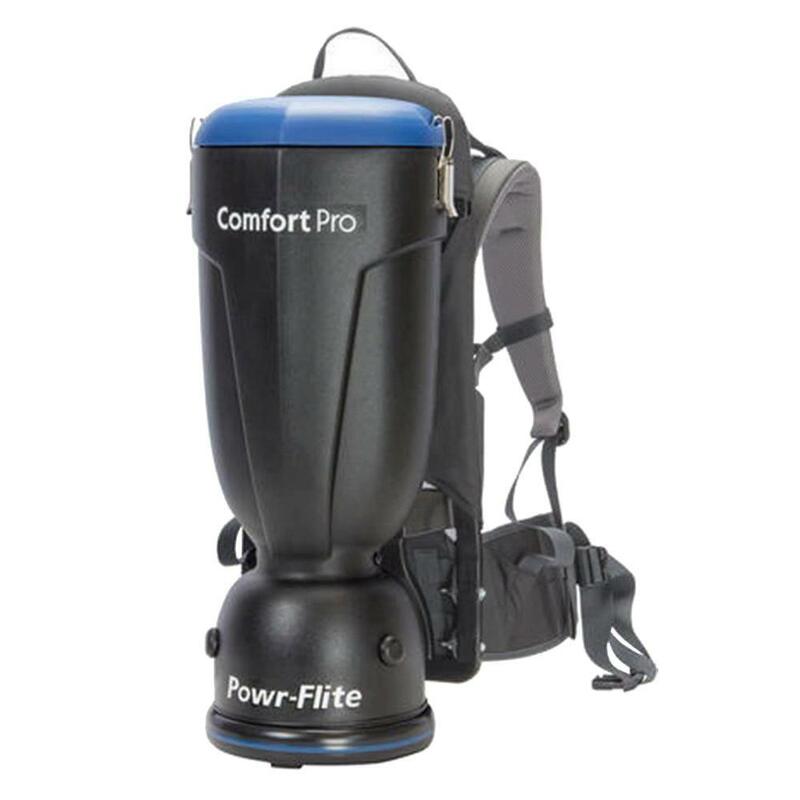 The convenient, lightweight unit is only 11.5 lb., great for moving around large offices and work sites. 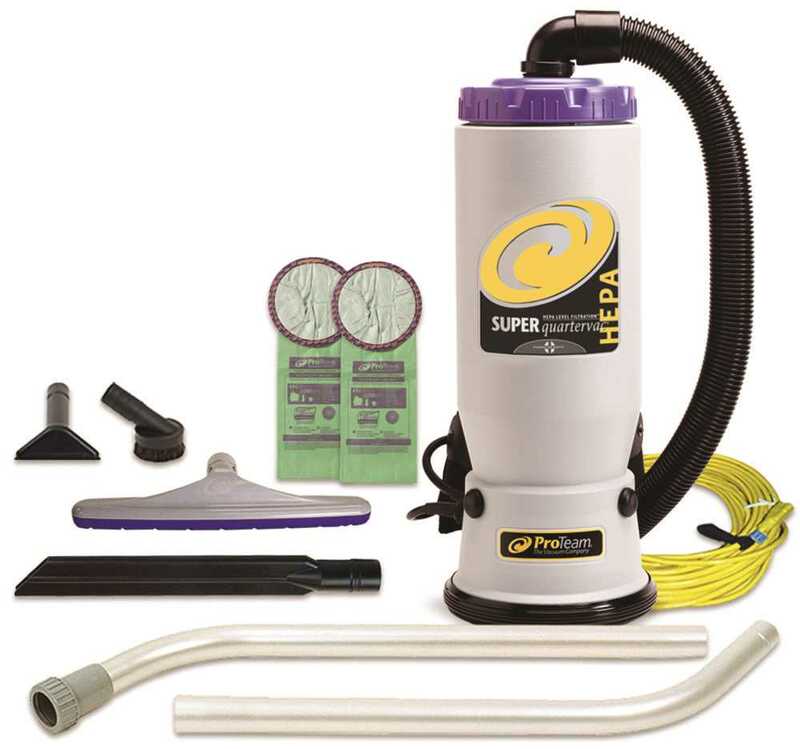 Features HEPA filtration and a 1.5-gallon dirt capacity for effective and efficient cleaning. 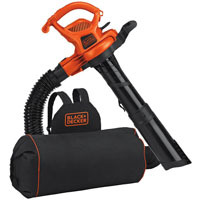 Vacuum cleaner includes a multitude of attachments such as: telescopic chrome steel wands, floor tool, deluxe floor and wall brush, dusting brush, crevice tool, 5-ft. crush-proof hose and upholstery tool--all of which make it easy to clean a variety of surfaces and hard-to-reach places. Power: 1,400 W; Tank Capacity: 1.5 gal; Color(s): Red; Weight: 11.5 lbs. 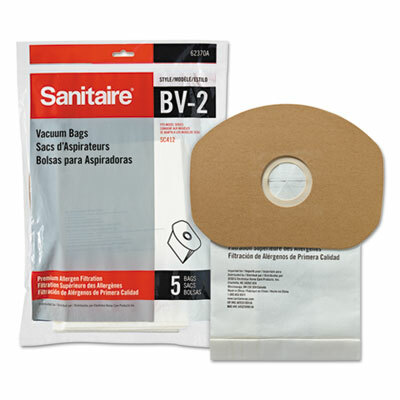 Disposable dust bags for Sanitaire� Commercial Backpack Vacuum. Great for trapping dust and dirt. OEM/Compatible: OEM. 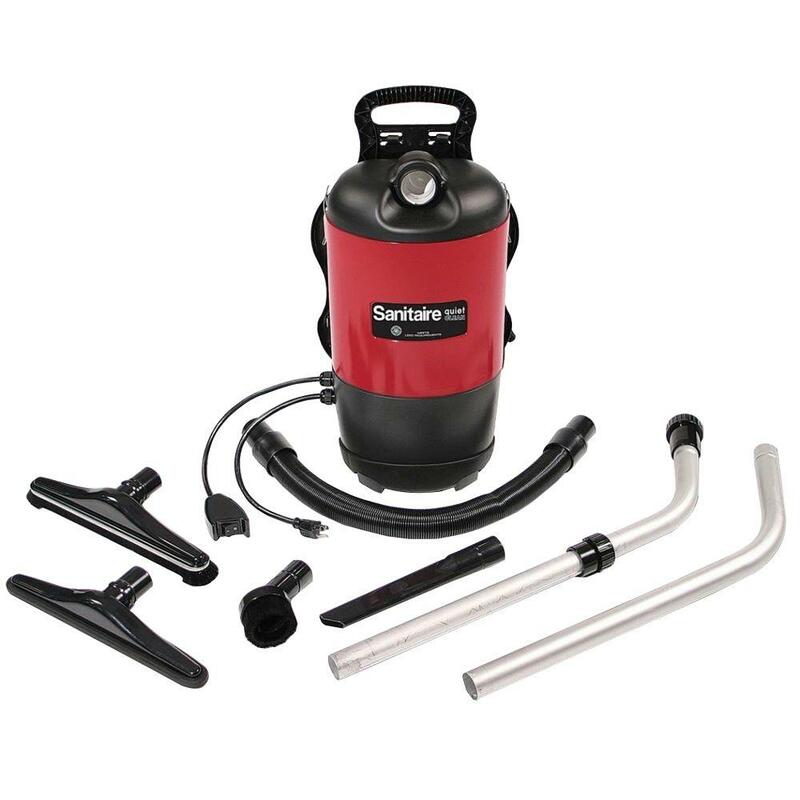 Clean more in less time with this powerful, 11.5-amp vac. 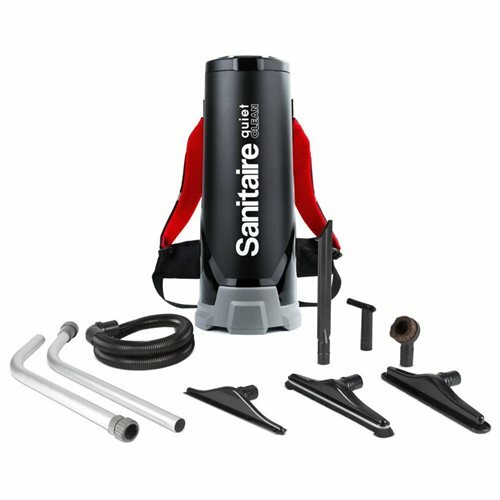 LEED-Compliant back-pack runs at an ultra-quiet 69 dB, enabling unintrusive daytime/business-hour cleaning of offices and healthcare facilities. HEPA filtration accommodates healthcare-industry allergen concerns. Padded, load-dispersion harness distributes weight evenly for better balance and enhanced wearing comfort. Two-piece metal wand and five-piece deluxe attachment set cover most common cleaning tasks. Extra-long 50-foot quick-disconnect power cord provides added convenience. Current: 11.5 A; Voltage: 110 V; Power: 1,400 W; Tank Capacity: 10 qt. HOOVER� SHOULDER VAC PRO COMMERCIAL BACKPACK VACUUM CLEANER WITH 48-INCH SJT CORD, 8.5 AMPS, 9.2 LBS. HOOVER� SHOULDER VAC PRO COMMERCIAL BACKPACK VACUUM CLEANER WITH 48-INCH SJT CORD, 8.5 AMPS, 9.2 LBS. Increase productivity with the HUSHTONE� backpack vacuum. The lightweight design and ergonomic harness enable easy maneuverability with less fatigue, minimizing downtime. Improve indoor air quality with HEPA filtration and Hexaguard� technology and self-sealing bags that trap dust in when disposing. The two-speed motor provides Hush� mode with less disruption when you want it and Boost mode for higher performance when you need it. Current: 10 amp; Voltage: 12 V; Power: 1300 W; Tank Capacity: 6 qt. Super Coach Pro� 6 The next generation in cleaning comfort. Ergonomic backpack design with patented articulating harness increases range of motion, reduces fatigue, and improves productivity. New triangular shape fits closer to the body and moves with the user, reducing the chance of bumping into doorways, walls, or furniture. The die-cast aluminum tri-latch system assures air performance. Four Level Filtration w/HEPA captures 99.97 percent of particulates 0.3 microns or larger, including fine carbon dust from the motor, for improved IAQ. Due to the angle of rear exhaust filters, the unit will not disturb papers on desks as it passes. Comes with 107100 Xover tool kit. 1 each. 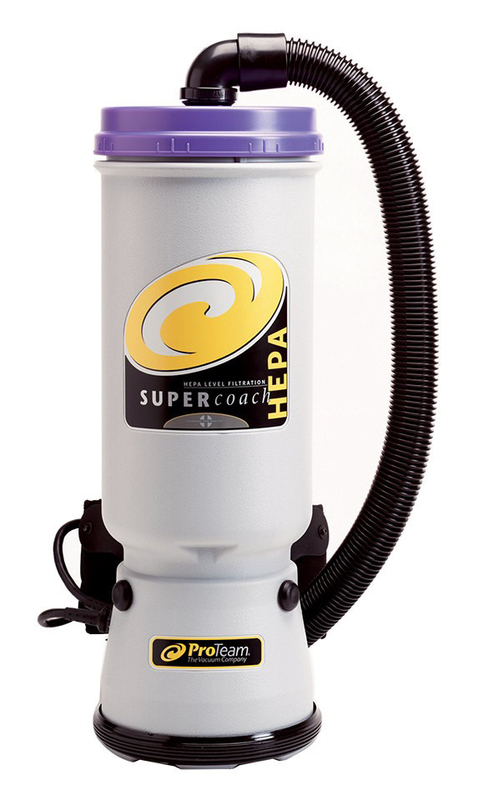 The Super CoachVac is a productivity powerhouse designed to tackle the most demanding cleaning challenges. 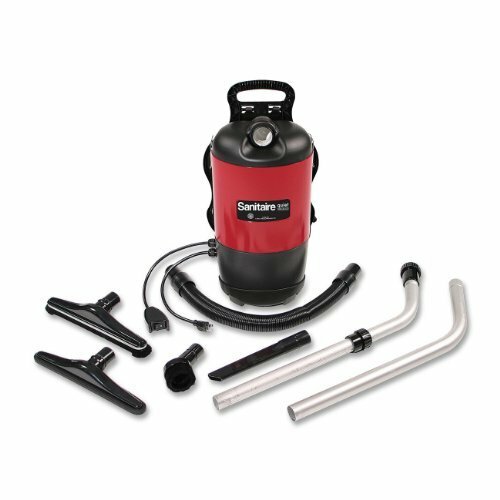 This powerful, high-filtration unit is ideal for vacuuming high square-footage areas that require the utmost cleanliness.^^Features|1-1/2" Static-Dissipating Vacuum Hose|50-Foot Extension Cord|2 Intercept Micro� Filters^^Specifications|Watts � 1,188|Weight � 11lbs.|Decibels � 66|Airflow - 150 CFM|Static Lift � 100"|Amps - 9.9|Capacity - 10 Quarts (11 Liters)|4-Level Filtration - 1,190 Sq. 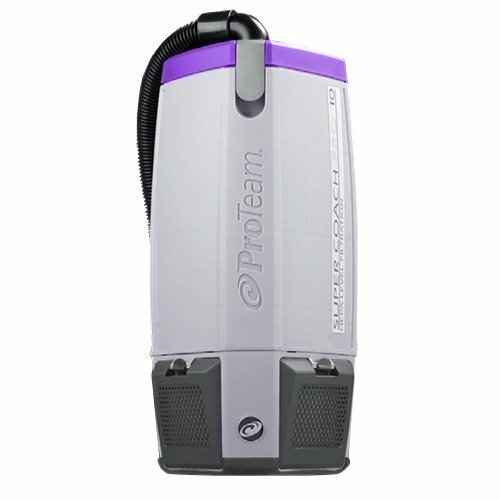 In.||Includes HEPA-Level Filtration^^Warranty Information^This commercial vacuum comes with a three-year warranty on parts, labor, and the motor. It also includes a lifetime warranty on molded body parts.